Our lawns are just starting to wake up from winter’s deep sleep. This is the time to remove the older blades of grass and debris that’s fallen between the soil and roots. This layer of thatch can prevent water and sunshine from nurturing your lawn. 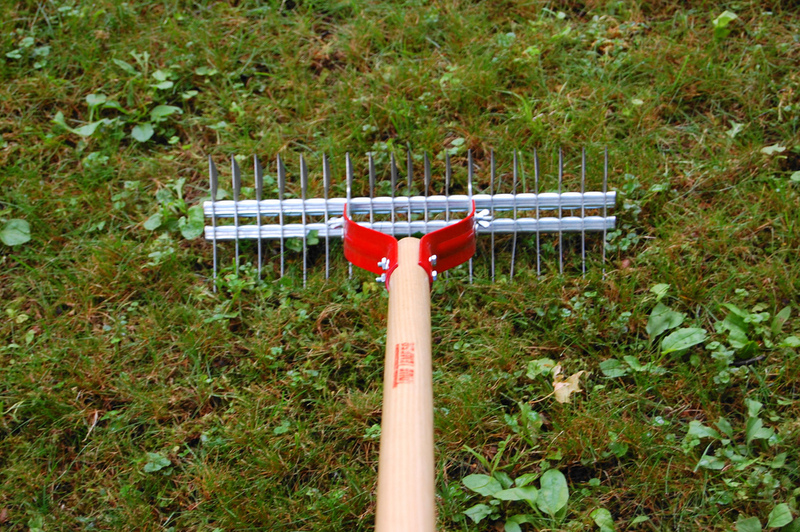 A deep raking will remove the thatch and any leftover leaves. It may also be a good idea to aerate the lawn. Poking holes in the soil will allow air and water to reach the roots. Getting rid of the weeds and pre-treating the problem spots will not only help your garden flourish, but it will also make it easier to maintain throughout the year. We recommend organic pesticides and weed killers. Some chemicals can hurt the birds, bees and other pollinators you’re trying to attract. The most common lawn disease we see in the spring is snow mold. Rounded patches of dead, matted grass start to appear after the snow melts. It may disappear in a few days. If not, you’ll want to apply fertilizer to keep the mold from spreading to the healthy part of your lawn. Not all grass is created equal, so picking the right turf for Portland’s wet spring and summer. Kentucky Bluegrass can handle our warm summers and our frigid winters, but it won’t do well if your lawn doesn’t get much sun. Tall Fescue does well in sun and shade and can handle Portland’s varying temperatures. Red Fescue is the only grass that’s native to Maine and usually needs the least amount of maintenance. Before choosing which seeds to use, it’s best to take a soil sample to your local cooperative extension service office for testing. The secret to beautiful turf is really all about proper fertilization. It’s easy to over-fertilize, thinking it may make for a lusher looking lawn. But too much fertilizer can kill a lawn. It can also cause runoff and leak into lakes and the ocean. A soil test can also help you determine how much fertilizer to use and if your lawn actually needs it. Now’s a great time to tune-up your lawn mower and sharpen the blades. You may also want to install an irrigation system or make updates and repairs to an existing one. A working irrigation system will conserve water by applying it more efficiently. By cleaning and seeding your lawn now, you should have a lush, green lawn by the end of the spring. Keep in mind, you don’t want to overdo it. Portland yard’s been through a tough, snow-packed winter and will time to dry out. But by following these simple tips, you should be ahead of the game and ready to enjoy that lawn this summer. Need help tending to your lawn? Visit our Portland lawn care page for more info! The post Spring Lawn Care Tips for Portland, ME appeared first on Lawnstarter.